This is harder than I thought it would be. First assuring the bolt pattern and offset wasn't easy. 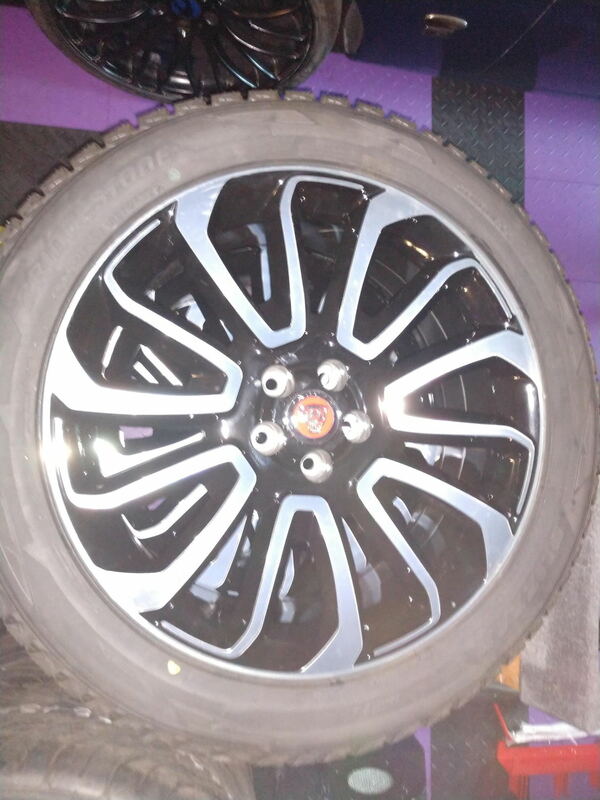 The dealer had the offset but could not confirm the bolt pattern (5/108), after searching on the web I finally found a tire store that had it and since it was the same as all current Jaguars I thought that to be reasonable. On the offset it ranged from +45mm for the 18" wheels to +54mm for the 22" wheels with the 20" wheels at +52mm. This implies there is a ton of room in the wheel wells but on the outside of the wheel not the inside. The wheels I could find were +49mm and 20" which does create some risk of rubbing on bumps on the inside which may mean that I'll need to use spacers we'll see. The wheels were on eBay for $750 for 4 and I got Bridgestone Blizzak tires for them also on eBay for $840 for 4. Clearly I should have put more light on the wheel as the picture is a tad blurry. The center cap I already had having bought it for my F-Type but in the wrong color (it spins keeping the Jaguar always vertical).